The work was high quality. The job was done on time and on budget. The price was great and the timing was great, I had no problems, it was a smooth process. He had to come back and repair tile that was damaged by someone else, and even though he was not at fault, he went out of his way to come back and fix the issue. He was very easy to work with. He is very quality conscious, does excellent work and punctual. 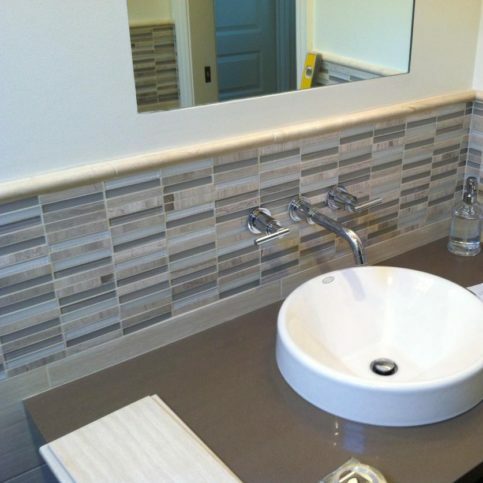 Derrick Tracey Custom Tile & Marble performs a wide range of tile work for kitchen and bathroom remodeling projects in Alameda and Contra Costa Counties. The company works on everything from kitchen backsplashes to bathtub tile replacements, and it backs all its labor with a five-year warranty. 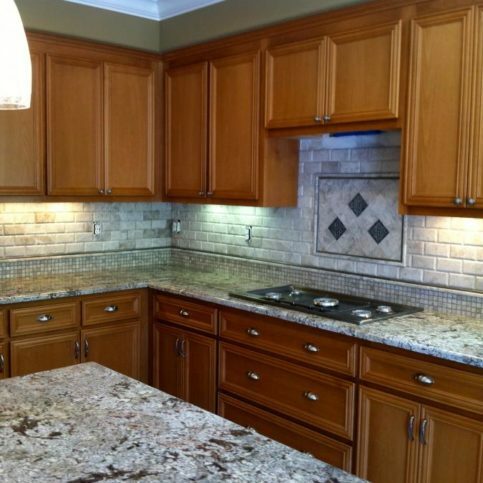 Derrick Tracey Custom Tile & Marble has been performing tile work for kitchen and bathroom remodeling projects in Alameda and Contra Costa Counties since 1993. The company has the training and equipment to work on everything from kitchen backsplashes to bathtub tile replacements, and it offers a five-year labor warranty on every job. Mosaic tiles are popular as well—they’re relatively small (usually two square inches or less), so they can be combined in intricate patterns and various colors and sizes. Mr. Tracey also suggests looking into brushed finish tiles, high-gloss tiles, matte and flat tiles, and natural stone tiles. Q: Can you help me find the right tile for my home? A: Absolutely. If you need materials, I can recommend several independent shops and tile showrooms that will provide you with many beautiful options from which to choose. A: It depends on numerous factors, but I’ll walk you through the process and tell you exactly how long each step will take. I have a lot of experience, so I’m good at sticking to my estimates and completing jobs on time. Q: What’s your process on tile projects? A: First, I’ll help you pick out the tile and other materials, which will let me know what kind of timeline I’ll be working with. Once I have all the products in hand, I’ll remove the existing materials that need to be replaced. I don’t do any demolition work until I have the new materials, so there won’t be any delays between tear-out and installation. Finally, when everything is perfect, I’ll clean up the jobsite. Q: How will you protect my home and keep it clean while you’re working? A: I’ll put down drop cloths and tarps to protect your flooring and other surfaces, and I’ll put up barriers to stop dust from getting out of the construction area and into the rest of your house. 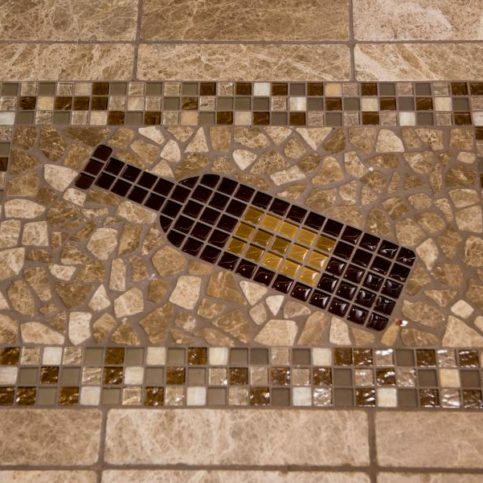 This mosaic design is featured in a client’s wine cellar. 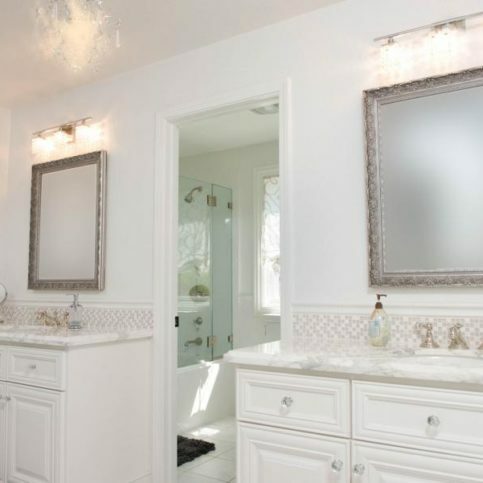 This “Jack and Jill” bathroom in Pleasanton features marble slab countertops and mosaic backsplash. 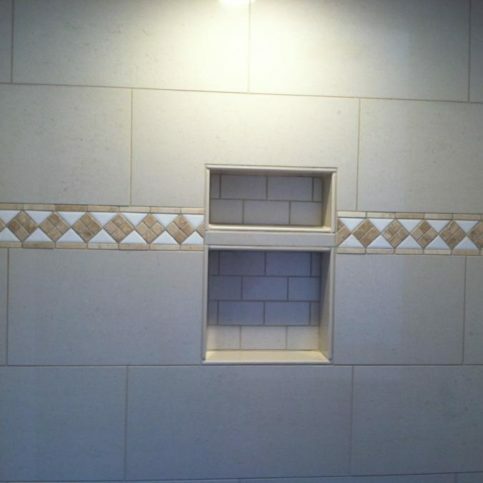 Derrick Tracey Custom Tile & Marble installed this mosaic backsplash in Pleasanton. 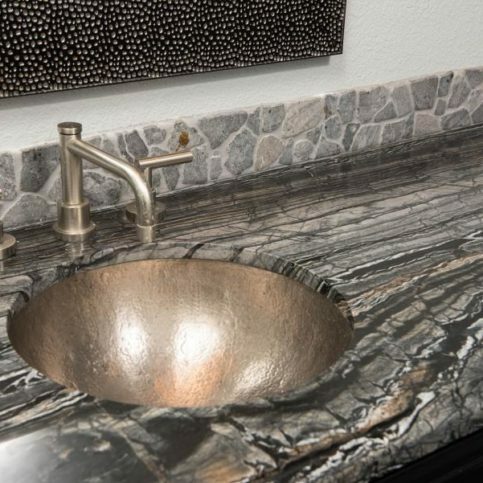 Derrick Tracey Custom Tile & Marble installed this marble slab vanity top with rock backsplash. 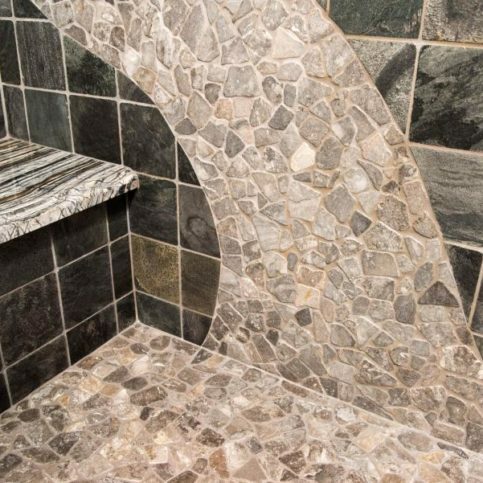 This shower features slate walls, a marble slab seat and a mosaic design that gives the appearance of a river rock bed. This bathtub features a marble top and is accented with mosaic marble designs on the face and backsplash. 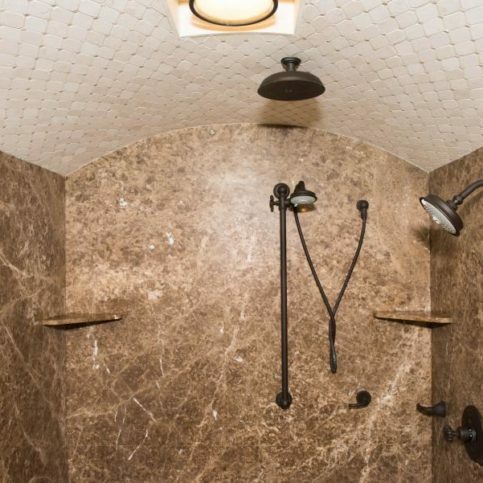 Derrick Tracey Custom Tile & Marble installed the mosaic tile on this arched ceiling in Livermore. 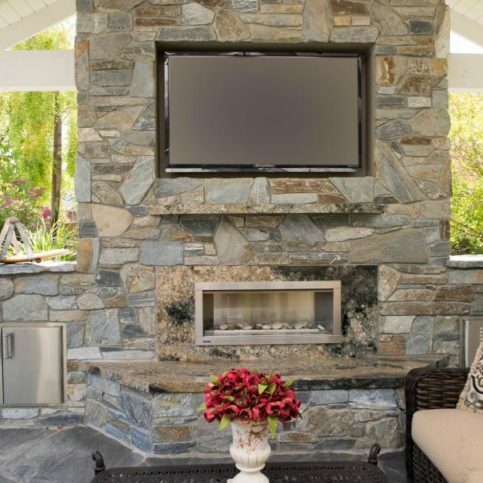 This outdoor entertainment center in San Ramon features rock on the walls of a marble slab fireplace. 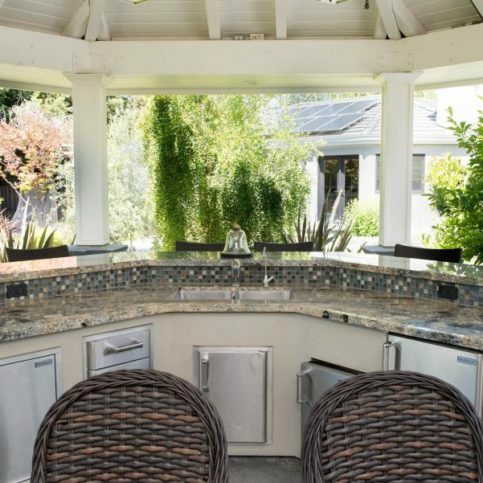 This outdoor kitchen in San Ramon features granite slab and is accented with mosaic backsplash. 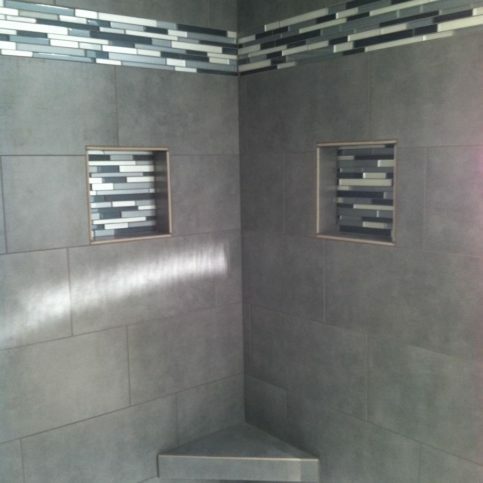 Derrick Tracey Custom Tile & Marble installed 12×24 tiles and mosaic liner accents in this shower. 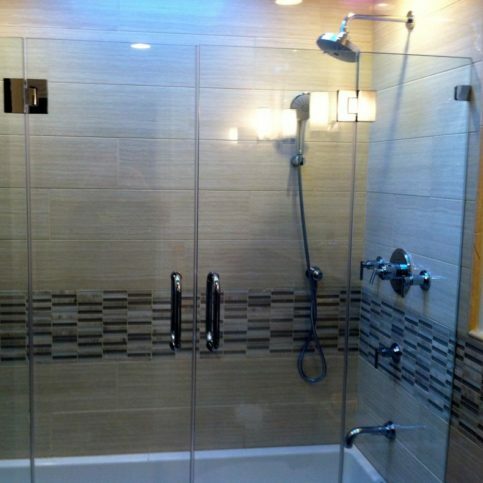 This shower features a 12×24 glass mosaic tile design. 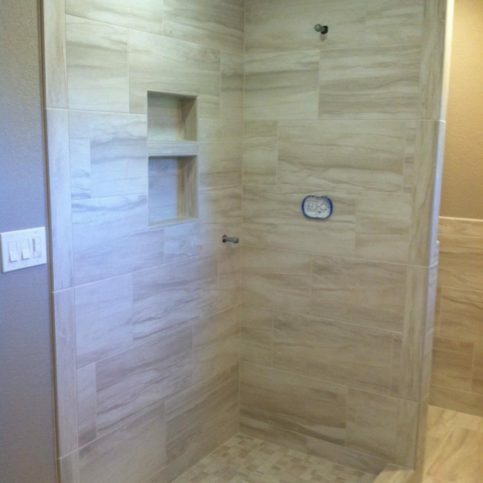 This shower features 12×24 tile walls and 2×2 tiles on the shower pan. Derrick Tracey is a 27-year veteran of the stone and tile industry and owner of Derrick Tracey Custom Tile & Marble, a Diamond Certified company. He can be reached at (925) 201-6125. A: Winter—I love the snow. Q: What’s your favorite kind of food? LIVERMORE — In the old days, sealing tile and grout was a messy (not to mention smelly) job, which is why most people left it to the professionals. Today, however, the emergence of water-based sealers has transformed this once-arduous task into something homeowners can easily do themselves. To seal your tile and grout, all you need is some water-based sealer, a bucket, a sponge and a pair of gloves. After pouring some sealer in the bucket, dip in your sponge and begin applying the product to your tile surface. Be generous in your application, and make sure you thoroughly cover the surface. Within a few minutes, the sealer will penetrate the surface and seal it, leaving a residue on top. At this point, all that’s left to do is dry off this residue with a towel, which will leave your tile surface nice and clean. 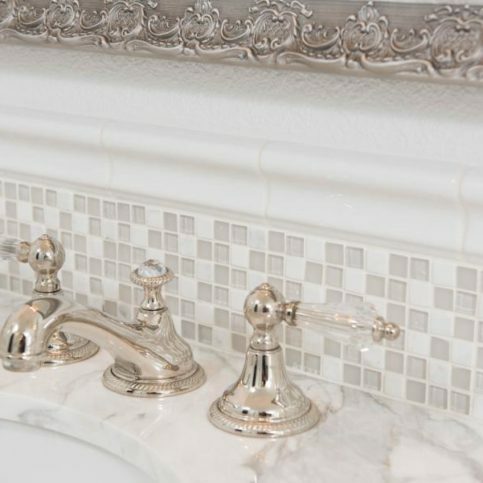 LIVERMORE — Host, Sarah Rutan: Sealing tile and grout was once a messy endeavor, but thanks to today’s cutting-edge products, it’s now something you can easily do yourself. Today we’re in Livermore with Diamond Certified Expert Contributor Derrick Tracey of Derrick Tracey Custom Tile & Marble to learn how. Diamond Certified Expert Contributor, Derrick Tracey: The question I always get is, “How do I seal my tile and grout?” Well, in the old days it was really messy and stinky and you had to paint it on. Nowadays, a lot of companies are making a water-based sealer which is really simple, easy to work with. It doesn’t smell. So, all you really need is some sealer from your local hardware store, a sponge, some gloves and a bucket. So, all you’ve got to do is pour some of the sealer in the bucket, there’s no mixing or anything like that. It’s really simple. Just pour it in. Get your gloves on and take your sponge, dip it in there, get some on, spread it around, try to get some more. You never can put too much on. Get it around, make sure it’s all everywhere. It’s going to penetrate in, seal it all up, and you just wait a few minutes, let it get in there. There will be a residual left on top and that’s after it’s all penetrated this stuff that’s left over, after a few minutes, just take your towel, dry off all the residual, make sure everything is dry, and it’s that simple. Host, Sarah Rutan: To learn more from local, top-rated companies, read our Diamond Certified Expert Reports at experts.diamondcertified.org. Derrick Tracey Custom Tile & Marble : Average 9.9 out of 10 based on 69 unique customer surveys of customer satisfaction. He is trustworthy, reliable, honest, and every positive thing you can find. He does quality work, and he stands behind it. They did a fine job. He explained everything clearly, and everything was upfront. He was very clear about explaining everything. That I think he listens to his clients and listens to their opinions, but he gives advice, yet I didn't feel pressured to take his advice. He was very easygoing and a pleasure to have in my house. I felt comfortable having him around my family and my house. He is really easy to work with, and he is overall a great person, a wonderful businessman. He was very easy to work with. He was on time, he checked in, he let me know if he was going to be late, and he kept in constant contact. The service was excellent, and the quality was great. He is professional and flexible. He is just very personable, easygoing, he answers all of your questions, and he keeps things neat and tidy. It was nice to have him in my home. His work was excellent. He is really prompt, he is a professional and gets the job done in a reasonable amount of time. You can feel comfortable with him being in your home for multiple days, he is very through and precise. The overall job was perfect. He was very knowledgeable, very willing to help, he had suggestions, and he took what we wanted and made it work. He personally came out, did the bid and he also did all the work. Derrick is good at what he does, and I trust his work. He did what he promised in the time he said he'd do it. I would definitely recommend him. He does outstanding work, and he is great to work with. I like his attention to detail. Derrick is very knowledgeable, competent, and he always does an amazing job. It's very easy to work with him. He's on time, he always does what he promises he'll do, and he is a very friendly person. I would say he does good work, and he's reliable. He's easy to get along with. His work is almost flawless and he is very creative. He is very good at what he does. I would give them a '15'. I like his quality of work. He is the best there is. He is very methodical, and he takes his time. He does exactly what the contractor and the client want. He also adds his point of view as well.